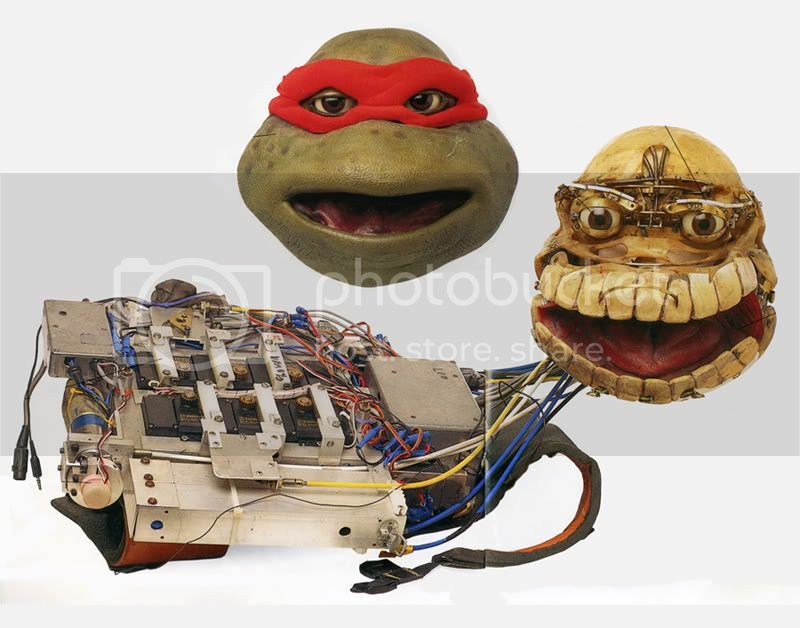 Probably one of the greatest pictures in ninja turtles prop history I have ever seen. very nice and sharp. really good find!! thanks!! Nice picture. Not to mention completely frightening. Haha, exactly what I thought. Freakish to see Raph without skin! Collecting mostly TMNT comics, movies and games released in Sweden. This is a very nice cool interesting thread....I never can imagine all about that!!! Thanks everybody for share that info/pics!!!! It's not from a movie. But some newer members might not have seen this. And yes, the costumes tend to fall apart with age. I have the same image from those Eyewitness books, a very cool picture to see what the original heads looked like. Ok, Raph stunt head from movie 3. Good shape, I keep it boxed up and out of the light. Last edited by Navin Johnson; 05-26-2012 at 06:01 AM. ^^ Has Tokka seen that yet? If not hell go nuts! Oh wow thats yours?! I've seen it on a prop collecting site. Awsome dude! Its such an odd prop to have eh? A great find though! Great props, Navin and Adam! Congratulations on finding those! Here is a Foot ninja mask from the first movie. Foot from 1 & 2.
wow that last picture of the foot soldier mask with the gloves and gauntlets just blew my mind. hahaha wow hot damn. if you ever want to sell those bad boys hit me up, i have a mighty big check for ya lol. hot dayum!!!!!! What a great thread! Seriously cool items in here. Haha, me too! I would be kinda scared of them falliing apart. You know what would be really cool is if all of us who have some kind of TMNT movie prop could have a meet up somewhere to have them all in one place at one time. It's a shame the "shellabration" wasn't all it was cracked up to be, this would have been a sight to see for sure. Though for people with bigger props it would be a logistical nightmare due to the fragile nature of the suits. If we ever end up getting a good DVD/Blu Ray release of the movies with all the features we want, it would be pretty cool for whoever puts it out to put a little money in the project and have a prop gallery section. I'm sure people would be interested in seeing this stuff. That might be a good idea for the Turtle Doc. To have all that stuff on there.